But now I don't feel safe or wanted in the fitness center. I chose to go to AU because of its culture of public service and activism; a large student organization advocating the most lethal mental illness to girls for the sake of "campus beautification" is objectifying, misogynistic, even violent. It's not as if it was just one random guy in a gross shirt; someone in his fraternity came up with the shirt, and enough "bros" wanted it that the frat ordered it and stamped its letters on it and its members wear it to the gym. It's indicative of an unsafe culture, where sorority sisters are worth little more than the cute donkeys and elephants dotting the campus. We're just here for aesthetics, but only as long as we're starving. I don't think it's too much to ask that students try not to trigger their classmates' eating disorders, especially at the fitness center. A dress code at the gym that includes a ban on offensive and potentially triggering items would be a great step. Other universities, including Harvard, Queens College, St. John's College and Kalamazoo College, have designated a few hours each week where the gym is women-only, and that would be even better. But for now, I only ask that my classmates be sensitive to the ways they present themselves, and how they make others feel. They may be driving more women away from the gym, which seems to be the opposite of their tasteless, insulting point. 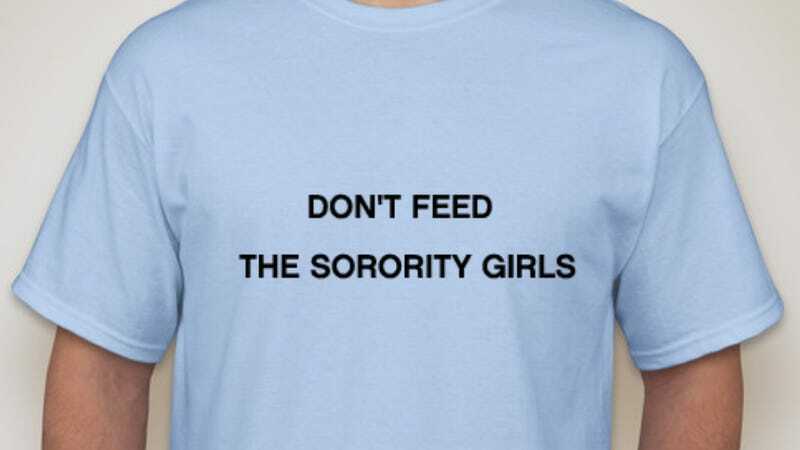 [The t-shirt] is a reference to sorority girls who crash fraternity parties to get free junk food and fatten up on it. It's not an attack on women in general who buy their own food and exercise. Why women are at such a higher probability for anorexia? Because they are dumb and dont want to take the time to learn how to correctly diet so they just stop eating and think that will work. ...or maybe because our culture is obsessed with dictating what their bodies should look like? The nature in which this article was written does not belong in any news outlet, it ought to be a "story of success" for an article discussing women battling eating disorders due to the author hijacking the story and converting it into a personal statement. The author cites she does not "feel safe" at the gym due to the garment in question. I find her word choice to be in very poor taste, yet it seems to appear that her writing style is quite attention seeking. As a result of tragic events that have taken place across the country, one's "safety" is now at an all-time high, however to insinuate that a slogan is "life-threatening" is overly dramatic. The IFC wrote a letter to the paper yesterday calling the t-shirt "provocative" and apologizing "for the offense taken." Not the t-shirt itself, of course, just the "offense taken." Typical. A spokesperson wrote that, since the shirts were deemed inappropriate immediately after they were printed, "the current existence of the design is the direct result of the decision of an individual within the organization and does not reflect the standards of the organization itself." In other words: it's not their fault, so shut up about it already. So many people involved in this story are on the defense, anxious not to be blamed for the actions of a few. But the goal of Lee's op-ed was clearly not to, as one commenter alleged, "group all males that frequent the fitness center collectively"; she just wanted to explain firsthand the importance of respecting others. Please save us your half-baked undergraduate arguments about free speech; no one's trying to take your rights away. Is it that hard for students to, as Lee wrote, "be sensitive to the ways they present themselves, and how they make others feel"? No. Try it sometime?